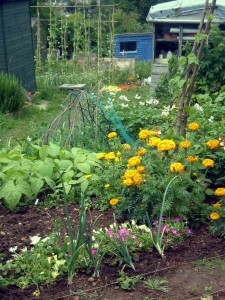 It is important for everyone that the allotment is an enjoyable and safe place to be. Below are a number of issues that you should be aware of in order for you to keep safety risks to a minimum and maximise every plot holders please from being on the allotment. There are some important health and safety issues on the allotments which should not be overlooked. Many hazards exist on the gardens and trouble can strike at any time and it is best to be prepared. Allotment gardens can be hazardous places to work, all a members should be aware of safety and are equally responsible for the safety of themselves as they are with their responsibilities for the safety of other members on the site. If any member spots any safety risk on the site they should contact a member of the committee as soon as possible so the issue can be dealt with. The site has many pathways and avenues and it can be very easy not to be heard or found if no one knows you are there. For the emergency services, anyone in trouble can be very hard to find amongst the maze of gardens. Try not to do dangerous work on your own or when neighbouring gardeners are not about. Do not do too much work in one go, have regular rests, and never carry out dangerous jobs when you are tired, as this is often when accidents can happen. Clean and protect all cuts with waterproof plasters. Wash hands after any gardening activity and before eating or handling food. Wear gardening gloves to protect your hands, although remember never to wear a glove on your hand which is holding a swinging tool such as a slasher, grass hook or axe. This will help prevent the tool from accidentally slipping out of you grasp. 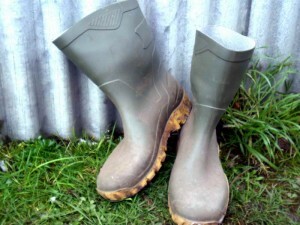 There may be broken glass, hazardous materials or heavy objects on plots, so wear appropriate gardening footwear, ideally with a thick sole and hardened toe to prevent injury from standing on anything sharp or dropping something heavy on your toes. Broken glass and hazardoue materials should be removed by members so that other members are no affected. Never leave tools where you may trip over them and never leave pronged tools with their prongs pointing upwards. Keep an eye on children and in if they are at risk from something they may not be aware of please help them. Parents are responsible for supervision and safety of their children while on site. Let a friend know when you are going to be working on the allotments and for roughly how long. Carry a mobile phone with you in case of emergencies. Make sure you know how to describe where your garden is. Know your garden number! Tetanus – This very serious infection is caused by a bacterium that lives in the soil and especially manured soil. It enters the body through a cut or open wound and a few days or weeks later the illness hits. You may not even be aware of the cut – bacteria are very small! A tetanus jab will prevent it but not cure it. You can get the jab from your doctor. If you find yourself in trouble shout for help. If you are in serious trouble and no one is there to help, use your mobile phone if you have one and call 999. You will need to be able to direct the emergency services to where you are on the allotments site. The location of the site is displayed on the notice board on the communal shed but it may be worth entering this on your phone for emergencies. If someone is with you and they can get help, arrange for someone to meet the emergency services at the entrance gate to the site. They can then unlock the gates and direct the emergency services to you much more quickly once they have arrived at the site.If you are able to talk to the emergency services tell them as much as possible about what has happened as this can save time when they arrive at the scene.Keep yourself warm. Do not panic and try to keep calm. Under the Environmental Protection Act 1990, it is an offence to cause a statutory nuisance. This includes smoke, fumes or gases created by bonfires. As an association we aim to enhance the local community and do not wish to cause a nuisance to our neighbours which has resulted in complaints to the council in the past. It is also essential for the pleasure and safety of other members on the site that you act considerately when lighting bonfires and make sure they are attended at all times until they have gone out.